Without getting into detail about the inaccuracies of the Gawker story, the source was obviously very unfamiliar with today’s changes. We have had tremendous success with our projects including SocialPlan, which today is being acquired by MySpace – which includes not only the site but also its core team. Most of the remaining team from Slingshot will be focused on a venture for which there is tremendous excitement. In other words, some of the people affected by today’s changes aren’t being laid off — they’re being shifted over to MySpace along with the SocialPlan project. SocialPlan was built by Slingshot as a replacement to MySpace’s underperforming events feature, and first launched in March 2009. 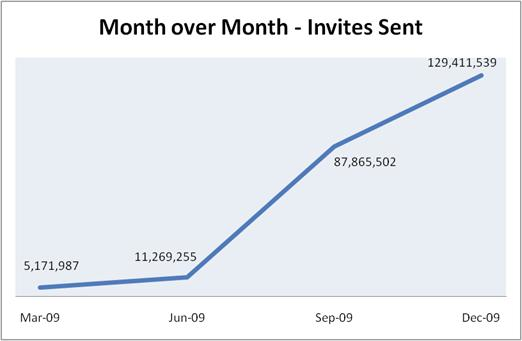 It quickly gained steam, overtaking Evite in the number of invites sent by July 2009. Since then, it’s apparently done very well — Berdakin sent along a graph showing its growth, which we’ve included below. Doing the math, it looks like SocialPlan is now used to send around 4.3 million invitations a day (Evite reports 600,000 invitations sent per day). Given its success, it’s pretty obvious why MySpace would want to take over the project. Berdakin wouldn’t comment on the project Slingshot is currently working on, but it seems likely that it’s the mysterious WSJ Connect “LinkedIn Killer” we first reported on last July.